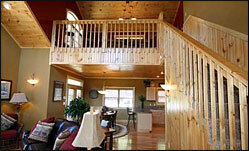 Above It All log cabin rental is brought to you by Baskins Creek Vacation Rentals located in Gatlinburg Tennessee. And as you can see from the picture to he right this cabin rental near Pigeon Forge TN is richly appointed with beautiful log cabin decor and all the right amenities. Everything from the hardwood floors, to the stone fireplace to the large kitchen to the comfortable furniture says luxury and warmth. This beautiful cabin in the heart of the Smokies is a 2 bedroom 2 bathroom home away from home that can sleep up to 4 adults and pamper you in a cozy atmosphere that will make your next Gatlinburg vacation one to remember for many years to come. After you vacation here you will probably want to return again and again. If the televisions in each bedroom don't get you, then maybe you will enjoy the beautiful log pool table in the loft area game room at the top of the stairs. You just might want to call this cabin your own and schedule a yearly retreat to the Great Smoky Mountains. Above It All cabin rental at Baskins Creek Vacation rentals is located only a few minutes away from the shopping, adventure, attractions and dining of the towns of Gatlinburg and Pigeon Forge. You are also a few minutes away from all that The Great Smoky Mountains National Park has to offer as well. The rental rated for this cabin in the Smokies range from $150 to $215 per night and a 2 night minimum is required with a 3 night minimum around holidays. Have a look at some more pictures and get more information on Above It All cabin rental.